In addition to his 21 CBS Radio Mystery Theater scripts, Fielden Farrington worked on two TV screenplays based on his novels. 11/25/1974 0178 The Sighting A couple encounters a UFO landing on Earth. Though the husband insists on denying what he saw, his wife starts to get neighbourly visits from aliens. 04/14/1975 0256 The Intermediary Childhood cruelty unhinges a man named Frank Ellington as he gets possession of the house where his stepmother tortured him. But he is convinced to relocate there by his wife whom he soon suspects to be an agent of his dead stepmother. 08/27/1975 0333 The Eavesdropper A renowned scientist spends time with his wife in their estate in the Poconos of Pennsylvania. Unknown to them, they are watched by hired spies. 09/29/1975 0355 You're Only Young Twice A serum that reverses the aging process is successfully created by a brilliant scientist. He plans to test it on himself and seduces his beautiful sister-in-law with the promise of eternal youth. 11/14/1975 0379 The Money Makers When a couple of counterfeiters set up their operation in an abandoned house, they are unaware that a spirit haunts the place. The wife of one of the criminals is placed in a bind when she learns of their illegal activities from the ghost. 08/12/1976 0506 The Haliday Prediction It seems that every prediction Cash Haliday makes in his Friday newspaper column comes true. Does he have uncanny insight, some sort of ESP, or as his secretary/girlfriend thinks, do things come true because he predicts them. 10/07/1976 0531 Pool of Fear A spoiled rich, Beth, feels her step-mother is trying to replace her mother. She befriends ex-con Matt and has him pose as her fiancee so that he can kill her step-mother Millie for $10,000. 11/09/1976 0549 The Colony Michael and Mary just want to spend some quiet time away with nature. After spotting a UFO, they stop in the sleepy town of Colony, New Hampshire to report it but find themselves in deep trouble with the law. Fielden Farrington had a thing for evil stepmothers and stepchildren: A Little Game (evil stepchild), Pool of Fear (evil stepchild), and The Intermediary (evil stepmother). I love his work. It is haunting. Those shows will always stay with me. I love(d) him. I loved him for the simple fact that how many people get to have a father-in-law with the incredibly great name of Fielden Farrington. He may have died but his gene pool lives on and does him proud. To Mrs. Farrington above, didn't seem to you as if the movie, "The Sixth Sense," was at least inspired by your father-in-laws story, "Mater Computer?" Fielden Farrington wrote some good, creepy things. 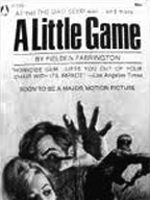 He had a thing about evil stepchildren and ghosts: Pool of Fear, Return To Shadow Lake, and the movie of the week, A Little game (another evil stepchild).